The best folk album of all time? Without question. 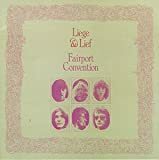 'Twas the year 1969, and Fairport Convention, despite the tragic loss of drummer Martin Lambie, reached the height of the powers with this classic. Alongside new drummer Dave Mattacks and violinist Dave Swarbrick, the band set about recording their own renditions of old traditional folk standards, with modern instrumentation and ideas. As a result, this album is half traditional, and half Fairport originals - it's a marriage that can only succeed. And it does, big time. The traditionals are probably the best works on this album, even if every song is a masterpiece - we begin with the atmospheric "Reynardine" with the excellent vocal sounds of Sandy Denny in full force - in a way, it's a shorter sequel to the last album's "A Sailor's Life", only sans the extended jamming. The best song on the album follows - "Matty Groves" is arguably the greatest piece of music Fairport ever recorded. Running on a catchy progression, and an excellent performance by Swarbrick on the violin, Sandy tells the tale of the unfortunate Matty Groves, a simple man who was whisked away by a rich lady, only to die at the hands of her husband. The song itself gives way to a massive close-out jam, with Thompson playing a classic solo over the rumbling drums. Pure brilliance. The next original is the memorable "Deserter", a great little tune, before Dave Swarbrick gives a career-best performance on the outstanding instrumental Medley - he runs through traditional classics such as "Lark in the Morning" and "Toss the Feathers" with such ease, while always keeping the mood lively. It's another outstanding Fairport achievement, as the band successfully manage to perform 4 traditional masterworks in 4 minutes. Brilliance. The same word can also be used for the slower "Tam Lin", another Fairport classic, with a chord progression that's instantly memorable, and a lovely little hook on the guitar that follows every line. It's yet another classic on this classic album. "Crazy Man Michael" along with Swarbrick - it's a great way to close out this record. Overall, this record can't get any lower than 10 - there's not a bad moment to be found. I would rate every one of these songs high on the list of Fairport classics - every song is instantly memorable and outstanding. A classic album - not just in the folk genre, but of all-time, and amazing in every way.